Q1:　What is Carbon Fiber? Carbon fibers are classified by the tensile modulus of the fiber. Tensile modulus is a measure of how much pulling force a certain diameter fiber can exert without breaking. The English unit of measurement is pounds of force per square inch of cross-sectional area, or psi. Carbon fibers classified as "low modulus" have a tensile modulus below 34.8 million psi (240 million kPa). Other classifications, in ascending order of tensile modulus, include "standard modulus," "intermediate modulus," "high modulus," and "ultrahigh modulus." Ultrahigh modulus carbon fibers have a tensile modulus of 72.5 -145.0 million psi (500 million-1.0 billion kPa). As a comparison, steel has a tensile modulus of about 29 million psi (200 million kPa). Thus, the strongest carbon fibers are ten times stronger than steel and eight times that of aluminum, not to mention much lighter than both materials, 5 and 1.5 times, respectively. Additionally, their fatigue properties are superior to all known metallic structures, and they are one of the most corrosion-resistant materials available, when coupled with the proper resins. Q2: How it is Made? The raw material used to make carbon fiber is called the precursor. About 90% of the carbon fibers produced are made from polyacrylonitrile (PAN). The remaining 10% are made from rayon or petroleum pitch. All of these materials are organic polymers, characterized by long strings of molecules bound together by carbon atoms. The exact composition of each precursor varies from one company to another and is generally considered a trade secret. During the manufacturing process, a variety of gases and liquids are used. Some of these materials are designed to react with the fiber to achieve a specific effect. Other materials are designed not to react or to prevent certain reactions with the fiber. As with the precursors, the exact compositions of many of these process materials are considered trade secrets. The process for making carbon fibers is part chemical and part mechanical. The precursor is drawn into long strands or fibers and then heated to a very high temperature with-out allowing it to come in contact with oxygen. Without oxygen, the fiber cannot burn. Instead, the high temperature causes the atoms in the fiber to vibrate violently until most of the non-carbon atoms are expelled. This process is called carbonization and leaves a fiber composed of long, tightly inter-locked chains of carbon atoms with only a few non-carbon atoms remaining. Acrylonitrile plastic powder is mixed with another plastic, like methyl acrylate or methyl methacrylate, and is reacted with a catalyst in a conventional suspension or solution polymerization process to form a polyacrylonitrile plastic. The fibers are then washed and stretched to the desired fiber diameter. The stretching helps align the molecules within the fiber and provide the basis for the formation of the tightly bonded carbon crystals after carbonization. Before the fibers are carbonized, they need to be chemically altered to convert their linear atomic bonding to a more thermally stable ladder bonding. This is accomplished by heating the fibers in air to about 390-590° F (200-300° C) for 30-120 minutes. This causes the fibers to pick up oxygen molecules from the air and rearrange their atomic bonding pattern. The stabilizing chemical reactions are complex and involve several steps, some of which occur simultaneously. They also generate their own heat, which must be controlled to avoid overheating the fibers. Commercially, the stabilization process uses a variety of equipment and techniques. In some processes, the fibers are drawn through a series of heated chambers. In others, the fibers pass over hot rollers and through beds of loose materials held in suspension by a flow of hot air. Some processes use heated air mixed with certain gases that chemically accelerate the stabilization. Once the fibers are stabilized, they are heated to a temperature of about 1,830-5,500° F (1,000-3,000° C) for several minutes in a furnace filled with a gas mixture that does not contain oxygen. The lack of oxygen prevents the fibers from burning in the very high temperatures. The gas pressure inside the furnace is kept higher than the outside air pressure and the points where the fibers enter and exit the furnace are sealed to keep oxygen from entering. As the fibers are heated, they begin to lose their non-carbon atoms, plus a few carbon atoms, in the form of various gases including water vapor, ammonia, carbon monoxide, carbon dioxide, hydrogen, nitrogen, and others. As the non-carbon atoms are expelled, the remaining carbon atoms form tightly bonded carbon crystals that are aligned more or less parallel to the long axis of the fiber. In some processes, two furnaces operating at two different temperatures are used to better control the rate of heating during carbonization. Treating the surfaceAfter carbonizing, the fibers have a surface that does not bond well with the epoxies and other materials used in composite materials. To give the fibers better bonding properties, their surface is slightly oxidized. The addition of oxygen atoms to the surface provides better chemical bonding properties and also etches and roughens the surface for better mechanical bonding properties. Oxidation can be achieved by immersing the fibers in various gases such as air, carbon dioxide, or ozone; or in various liquids such as sodium hypochlorite or nitric acid. The fibers can also be coated electrolytically by making the fibers the positive terminal in a bath filled with various electrically conductive materials. The surface treatment process must be carefully controlled to avoid forming tiny surface defects, such as pits, which could cause fiber failure. After the surface treatment, the fibers are coated to protect them from damage during winding or weaving. This process is called sizing. Coating materials are chosen to be compatible with the adhesive used to form composite materials. Typical coating materials include epoxy, polyester, nylon, urethane, and others. The coated fibers are wound onto cylinders called bobbins. The bobbins are loaded into a spinning machine and the fibers are twisted into yarns of various sizes. Q3: Why Carbon Fiber is light and strong? Carbon Fiber is composed of carbon atoms by more than 90%. These carbon atoms are lighter than any metal atoms. Beautifully shining diamonds, Bincho-Charcoal, activated charcoal and graphite belong to the group of materials composed of carbon atoms, and in fact Carbon Fiber also belongs to this group and has similar properties to diamond. Diamond is the hardest and strongest material in the world, whereas it is known that graphite is soft and slippery. The reason for this difference is said to come from difference in crystal structure. Bincho-Charcoal and the like are soft and slippery because of their complicated irregular structure, whereas diamonds are very strong because of regular and orderly structure. Diamonds have 3D structure of carbon atoms, and Carbon Fibers have 2D mesh structure (like meshes of henhouses) with carbon atoms orderly lined up to fiber direction and entwine together. Furthermore, we can say that they are strong as they are manufactured very carefully lest they should have foreign materials or defects with them. Q4: Please explain about difference between Carbon Fiber and other carbon materials (Charcoal,Graphite). Both Carbon Fiber and Charcoal belong to carbon material group. Both have crystal structure of graphite structure but are quite different in regularity and way of line up from each other. In case of Carbon Fiber, carbon atoms line up regularly and orderly, form mesh structure with layers piling up and entwining each other, whereas in case of Charcoal, this layer structure is amorphous and irregular without strong entwining each other, resulting in fragility and low strength. Graphite belongs to the same group having advanced regular graphite structure. It is known that graphite is soft and slippery. Natural graphite is produced in China, India and other countries. The illustration shows a descriptive picture how the molecular structure of a single thread of carbon fiber is being generated step by step under respective processing conditions of carbonization and graphitization procedures. The picture gives you a clear idea in what manner carbon atoms become regularly lined up along the longitudinal direction of a filament by means of high temperature treatments and stretching. Q5: Please explain about properties and application of PAN Type Carbon Fiber and Pitch Type Carbon Fiber. PAN Type Carbon Fiber is an aggregation of continuous fiber (filaments), 5 �C 7 micron meter in diameter with 1.74 - 1.95 g/cm3 of density, generally. Products with various filaments, such as 1K (1000 filaments), 3K (3000 filaments), 6K (6000 filaments), 12K (12000 filaments) and 24K (24000 filaments), referred to as “Regular Tow” or “Small Tow”, have been used in large quantity for aircrafts and sports/recreational fields, making good use of low density, high specific tensile strength and high specific elastic modulus. PAN fibers have been undertaken a role for market expansion of carbon fibers. Large Tow, extra-40K, even though slightly lower tensile strength is mainly used for industrial fields as a relatively inexpensive material, along with Regular Tow. PAN type carbon fibers are classified into Standard Elastic Modulus Type (- 240 GPa), Intermediate Elastic Modulus Type (- 300 GPa) and High Elastic Modulus Type (350 GPa -). Regarding Pitch Type Carbon Fiber, there are continuous type and discontinuous type, based on respective spinning process. Pitch Type Carbon Fiber is also classified into Isotropic Type (hardly-graphitizability) and Un-isotropic Type (easy-graphitizability), based on respective raw pitch. Isotropic Pitch Type Carbon Fiber is commonly a discontinuous fiber of 12 - 18 micron meter in diameter with 1.6 g/cm3 of density and has the properties of low modulus (- 40 GPa), strength and thermal conductivity due to its weak structural orientation of carbon atoms and underdeveloped graphite crystallinity. With its competitive cost, Isotropic Pitch Type Carbon Fiber is extensively applied for industrial fields due to light weight, chemical stability, heat resistance and abrasion characteristic. On the other hand, Un-isotropic Pitch Type Carbon Fiber is sometimes referred to as “Mesophase Pitch Type Carbon Fiber”. This fiber is commonly a continuous fiber (filaments) of 7 - 10 micron meter in diameter with 1.7 - 2.2 g/cm3 of density. There are 1K, 2K, 3K, 6K and 12K as filaments per tow and wide variety of elastic modulus grades from 6 GPa (the lowest) to 953 GPa (the highest), whereas PAN Type Carbon Fiber cannot achieve this range. High Elastic Modulus Type Carbon Fiber (350 GPa -) has excellent processability due to high tensile strength, more than 2.5 GPa, and has been extensively applied for industrial and sports/recreation fields utilizing higher stiffness than iron and light weight (50% or less than iron) as molded composite materials. Applications for Ultra High Elastic Modulus Type Carbon Fiber (600 GPa -) are expanding, utilizing excellent stiffness, equivalent or higher thermal conductivity to metals and lightness in weight. Please refer to "The Future of Carbon Fiber ". Q6: The History of Carbon Fibe? The History of Carbon FiberDuring the 1970s, experimental work to find alternative raw materials led to the introduction of carbon fibers made from a petroleum pitch derived from oil processing. These fibers contained about 85% carbon and had excellent flexural strength. Unfortunately, they had only limited compression strength and were not widely accepted. Today, carbon fibers are an important part of many products, and new applications are being developed every year. 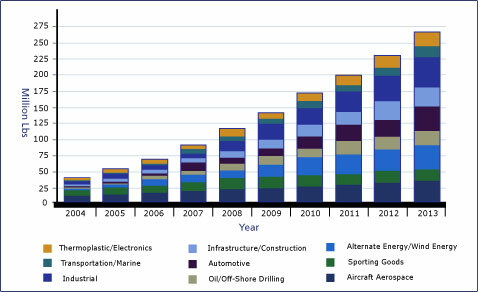 The United States, Japan, and Western Europe are the leading producers of carbon fibers. Q7: The Future of Carbon Fiber? Understand that the primary competitors to carbon fibers are other materials, not other carbon fiber manufacturers. cure or chemical reaction (see also catalyst). to bond them together by surface attachment. is an acute angle with the principal laminate axis. per unit area (width times length) of tape or fabric. curing while removing entrapped air and volatiles. and directions by using an automated tape-application machine. autoclave, press or inflation of the bag. pattern designed so that the stresses in all filaments are equal. with an equal number of plies having -45° and +45° orientations. an instrument that measures hardness on a 0-100 scale. flatter, stronger, more pliable fabric (see plain weave). fibers are at an angle to the length. through-the-thickness stitching, to form a single sheet of fabric. oriented in more than one direction on the same plane. preforms to bond the fibers prior to laminating or molding. allows excess gas and resin to escape during cure. BMC - See Bulk molding compound. contact with the honeycomb core during repair. often referred to as a wire. the edges of a composite part are drilled or cut. path over a part in production. resin that has formed on edges during cure. reduce or eliminate a resin"s tendency to burn. use in compression-, transfer- or injection-molding processes. interchangeably with the term graphite, but the fibers differ. CFRP - Carbon Fiber-Reinforced Polymer. means some strands in the roving length are longer than others. rotated as resin is cured. onto a continuous core such as boron or tungsten. fiber perpendicular to the axis during filament winding. CMC - See Ceramic-matrix composite. the change in length or volume of an object. of a defect that may require repair. achieved by any of the components acting alone. take its final shape and the part is allowed to cure. divided by its original cross-sectional area. which simple byproducts (e.g., water) are released. small-diameter fiber of indefinite length. (may also be used chopped). Core depression - A gouge or indentation in the core material. Core separation - A breaking of honeycomb core cells. thermoplastic fibers woven side by side with carbon fibers). develop on or under a resin surface. determines its capacity to cohere. oriented only at 0° and 90°. May or may not be symmetrical. Damage tolerance - A measure of a structure"s ability to retain load-carrying capability after exposure to sudden loads (for example, ballistic impact). specific level of statistical confidence. ability of a material to resist the flow of an electric current. 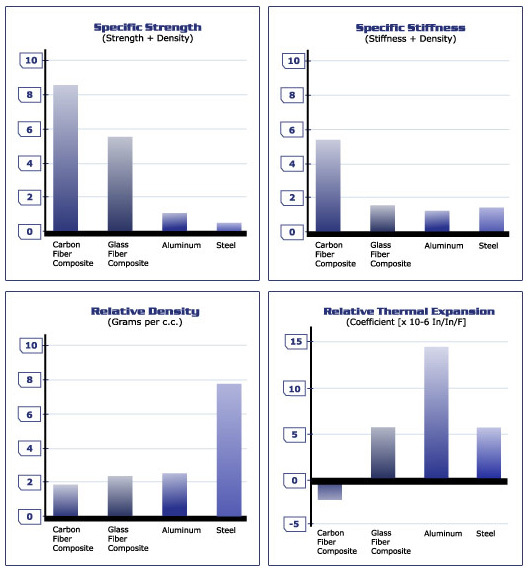 strength offers excellent electrical insulating properties. expected to incur abrupt load transfers. sides of a mold so the part can be removed. conform to a contoured surface. E-glass- Abbreviation for "electrical glass," borosilicate glass fibers, which have high electrical resistivity. Most often used in conventional polymer matrix composites. complete release of the stress (see stress and strain). the original length, it is called percent elongation. parallel, collimated filaments, with or without twist. contained in a particular roving. mold damage and, in extreme cases, could produce an explosion. Fabric- Planar textile. Also known as cloth. mechanical, chemical, thermal or solvent means. interlacing fibers or yarns, using a weaving process. loading or deformation over time. residual strength after being subjected to fatigue loading. FEA - See Finite-element analysis. fabrics are common forms of fiber architecture. caused by shrinkage stresses around such a radius during cure. content and 40 percent resin content). most often used in reference to glass fiber-reinforced polymer. about 0.002 inches in diameter are often referred to as wires. cross-section of a fiber bundle. a depression in a repair or build up an edge. computer-based computational modeling and analysis. corresponding strain in the outermost fibers of the sample. a bent test sample at the instant of failure. tolerance of a material containing initial flaws or cracks. FRP - See Fiber-reinforced polymer. Gel- To enter an initial jelly-like, semi-solid phase during a resin curing process. smooth, more impervious finish on the part exterior. occurs as defined by a specific test method. Glass fiber - see Fiberglass. value of Tg can vary, depending on the test method. Halogenated resin - A resin combined with chlorine or bromine to increase fire retardancy. HAPs - see Hazardous air pollutants. Hard tool - A tool made of metal or any "hard"
contrast to soft tool). See tool. material is or will be subjected. specified distance under a stated load. mandrel at an angle, often at a 45° angle. ceramic matrices to achieve their superior properties. mandrel at a 90° angle to the long axis of the mandrel. Impact strength - A material"s ability to withstand shock loading as measured during a test in which a specimen is fractured. interstices of a reinforcement with resin. discontinuity occurring within a material or part. eliminating the need for an oven or autoclave as a heat source. the reinforcement and laminating resin meet. or more adjacent laminae in a laminate. single lamina in a laminate. Intumescent - Capable of swelling or enlarging. effective barrier to heat and/or flame when exposed to either. Kevlar- Trademark of DuPont for high-performance para-aramid fibers used as reinforcements (see aramid). more orientations with respect to some reference direction. parts and bonding them together. the stacking sequence of laminated composites. attack or to prevent leakage under stress. formulated for low-to-zero shrinkage during molding. MACT - Maximum Achievable Control Technology. A technology-based air pollution control standard developed by the U.S. Environmental Protection Agency (EPA) aimed at reducing emissions of hazardous air pollutants (HAPs) from U.S. manufacturing operations. thermoplastic polymers, metals and ceramic compounds. volume. For polymer-matrix composites this is the resin content. strands hammer-milled into very short fibers. MMC - See Metal-matrix composite. the absorption of water by immersion. surface appearance (also known as a tool). a part from sticking to a mold surface. like or unlike molecules to form a polymer. enough to function as a fiber in textile or other operations. continuous filaments (also see yarn and tow). Naphtha - A petroleum distillate commonly used as a solvent for natural resins and rubber. minimal machining, cutting or other finishing. do not require machining or cutting. paper form to make honeycomb core. evaluation (NDE) are broadly considered synonymous with NDI. composed of continuous fiber strands loosely gathered together. a single part is produced. name; for example, Boeing 777 aircraft or Prince tennis racquets. freezer, in the case of thermoset prepregs). moisture from composite parts under a vacuum. perforated to vent excess resin. It is removed after cure. the surface of a cured composite part. precursor in the manufacture of certain carbon fibers. in molding, casting, extruding or laminating processes. together, with or without twist. together to form a plied yarn. from the reference direction and negative if measured clockwise. change in length per unit length. manufacture of certain carbon fibers. combining many smaller molecules (monomers) in a regular pattern. surface of a solid material into which air or liquids may pass. or adhesive before pressure is applied. time and labor during the molding process. improve processing, storage and handling characteristics. contracts, sharing portions of the contract funding. coincides with the direction of maximum inplane Young"s modulus. between a catalyst and a resin (also known as an accelerator). material or completely through the part thickness. transformation of a compound caused by exposure to heat. orientation of plies in multiple directions. Ramping - A programmed gradual increase/ decrease in temperature and/or pressure to control cure or cooling of composite parts. than a single prototype or small number of demonstration parts. reaction to produce other substances. matrix to provide the required properties (primarily strength). braided, woven or stitched textile forms. the two during cure and facilitates demolding after cure. resin in excess of the expected resin/fiber ratio in a composite. that lacks sufficient resin to achieve thorough fiber wetout. fabricators to consolidate large parts. by temperature and pressure to achieve desired flow characteristics. RTM - See [b]Resin transfer molding. S-glass- The standard abbreviation for "structural glass," which is a magnesia/alumina/silicate glass fiber reinforcement designed to provide the very high tensile strength required in high-performance composites. to a joint, hardens in place to form a seal. adhesive, of two or more already cured composite parts. bleeder systems" removal from laminate after cure. cause one to slide relative to the other. material is capable of sustaining. filaments, facilitating operations such as weaving or braiding. replaced with finish before matrix application. Also called size. the outer surfaces of the core material in a sandwich structure. be acceptable to a potential user. measured amount of resin and catalyst, onto an open mold. respect to some reference direction (also see ply schedule). strain for a particular material. given direction; expressed as a percentage or in inches per inch. or shape, expressed in units of force (load) per unit area. applied stress in the region of a notch, void, hole or inclusion. internally, externally or in combination. transfer loads between adhesively bonded surfaces. purpose, such as bonding or coating. than glass or carbon, such as polyester. Tack- Stickiness of an uncured prepreg. weight in grams of 1,000m of filament fibers, yarns or strands. Tg - See Glass-transition temperature. softened state can be reshaped by means of molding or extrusion. cannot be returned to the uncured state. immediately afterward resist running on a vertical surface. in order to make a part. or silicone, used to make a tool. is specific to carbon fiber. by 1,000 (for example, 12K tow has 12,000 filaments). to distinguish warp fibers frfill fibers. a right-handed twist, while "S"-twist denotes a left-handed twist. Ultrahigh molecular weight (UHMW) polyethylene - A polyethylene (PE) resin with very high molecular weight and very high abrasion resistance and impact strength. orientation of fibers in one direction. resins and adhesives with ultraviolet light. Vacuum-bag molding - Molding technique wherein a part layed up on an open mold is cured under a layer of sealed film from which entrapped air has been removed by vacuum. The technique more effectively consolidates the laminate and reduces void content, compared to conventional open molding. containing ester of acrylic and/or methacrylic acids. ambient or slightly elevated temperatures. (HAPs) because of potential health concerns. Warp - Fiber bundles in a woven fabric that run parallel to the length of the loom and lengthwise along the longer dimension of the finished fabric. ab-sorbed by a material to the weight of dry material. tow over seven fill tows and under the eighth). between reinforcement strands and filaments. promotes wetting by decreasing a liquid"s cohesion. filament used as a reinforcement in a matrix. carbide fiber). In contrast, see filament and fiber. the electrical charge from lighting. Y-axis- The axis in the plane of a laminate perpendicular to the x-axis. essentially parallel, collimated filaments, usually with a twist. permanent deformation of a stressed specimen begins to take place. does not allow loss of resin during cure.